Tasha was a wonderful lady and I love many of the same things as her. Especially tea and corgis! 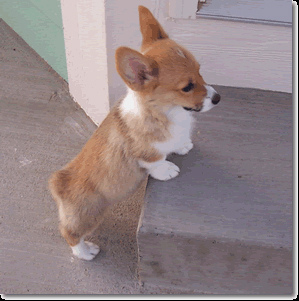 Corgis are my favorite kind of dog and someday I will definitely own one. Anyway to celebrate I had a nice tea today (okay so I usually do that anyway) and looked at one of the books I have had forever. This book was and still is very special to me since I have had it for so long. I am sure it is very special to a lot of people since it is a Tasha Tudor classic. It was given to me for my birthday by the daughters of the lady whose daycare I went to. They were my friends, but older than me. It still has their notes in it! I guess it was my third birthday. Also, the weather did some special things today and I would like to think it was in honor of Tasha. Did you do anything to celebrate Tasha Tudor Day? Are you curious to know more about her? Go here. Happy Tasha Tudor Day to you! I know it's Sunday, but I celebrated Tasha Tudor Day at my blog yesterday and I'm still making the rounds today to everyone else's blog. I loved your post. It's so beautiful that you still have A is for Annabelle that was given to you when you were only three. That is incredibly special. And you still have the card. What a lovely memory. Your photos of the rainbow and the clouds opening up to see the sunshine come through are gorgeous. What a meaningful way to celebrate Tasha. Thank you so much for this post. And your blog is wonderful, too. I hope you can drop by and visit me over at CluckleBees, too. Happy Tasha Tudor Day to you! Those pics. of the sky are stunning! I am a girl with a bit of a problem in that I like too many things and none of them seem to go together. You know those blogs that are lovely and cohesive and have a very specific look and style? Swoon worthy I know! Unfortunately that will never be me and I have come to accept it. I mean how do you create any kind of decor scheme when your interests include adventures, pirates, tea, Victorian England, Doctor Who, tropical paradises, Jimmy Buffett, and all manner of nerd-dom, and gypsy magic? It can't be done I tell you! I have so many disparate sides, none of which I can seem to give up, and so this blog explores all of them. And also food. And occasionally corgis. Who Wouldn't Want To Own A Castle? All pictures and text are the property of Buccaneers and Ball Gowns unless otherwise noted. Please give credit. Not sure about copyright? Click here for an informational video! Blog customization and design, including the cute corgi logo, are courtesy of Lovely Line Design.